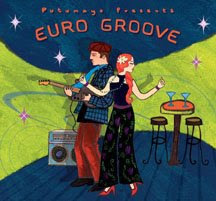 Featuring leading musicians, producers and DJs from Europe, Euro Groove is the latest release from Putumayo World Music . Click here for a preview of these cool, contemporary grooves. The first lucky reader to email to us at elledeco@elledecomag.co.za, naming one of the artists on the album gets their very own copy of Euro Groove . Please remember to include your name and address in your mail.